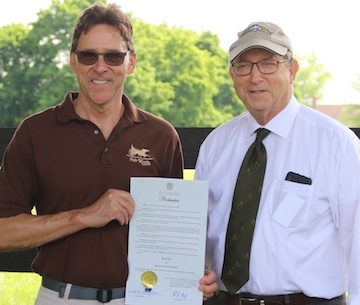 CREAM RIDGE, NJ -- June 11, 2018 -- New Jersey Secretary of Agriculture Douglas H. Fisher visited Standardbred breeding facility Fair Winds Farm on Friday and presented owner Mark Mullen with a proclamation from Gov. Phil Murphy declaring June the Month of the Horse in the Garden State. The horse was designated the state animal in 1977. Other officials attending the ceremony included State Assemblymen Ron Dancer and Eric Houghtaling as well as Monmouth County Freeholders Gerry Scharfenberger and Patrick Impreveduto. 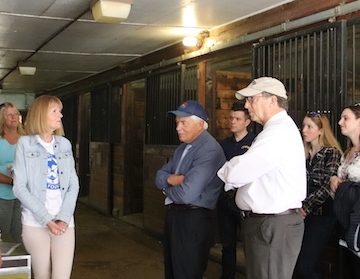 The event, arranged through the Standardbred Breeders & Owners Association of New Jersey, included a tour of Fair Wind Farm, a visit with Dr. Patty Hogan at Hogan Equine Clinic, which is located on the grounds of the farm, and a presentation from the Harness Horse Youth Foundation. Fair Wind Farms, a 500-acre breeding and boarding facility in Upper Freehold Township, was the state’s Standardbred Breeder of the Year in 2017. It has been in operation for nearly 50 years. Assemblymen Dancer and Houghtaling told those in attendance that Thursday was a “big day” for the state’s equine industry because the legislature had unanimously passed a bill that would permit casinos and racetrack to offer sports betting and the assembly advanced a bill that would exempt horse boarding from state sales tax. Gov. Murphy signed the sports betting bill Monday. Houghtaling, too, was buoyed by the sports betting bill and its potential impact on the equine industry. 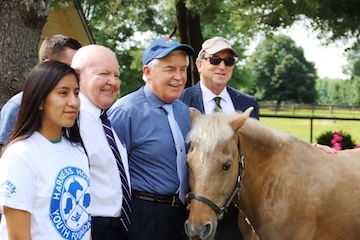 Monmouth County Freeholders Scharfenberger and Impreveduto also presented Mullen with a proclamation celebrating the equine industry and the Month of the Horse. Other speakers during the event included SBOANJ Executive Administrator Al Ochsner and Mullen. Fair Winds, which is home to 35 broodmares, last year enjoyed its best yearling sale at the Standardbred Horse Sale, with $1.74 million in gross sales and sales-leading average of $92,000 for 19 horses. 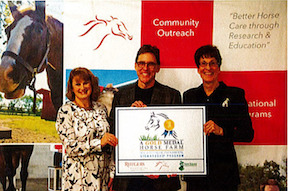 “We’ve faced many challenges over the years keeping racing and breeding in New Jersey strong,” said Mullen, who also serves as the SBOANJ’s first vice president. “These recent legislatives success that we had yesterday with the sports wagering and the revision of the sales tax are significant and important improvements for us. Fisher and other visitors remained on the farm for more than an hour, touring the facilities and talking with members of the racing community. “I think we’re going to see some brighter days going forward,” Fisher said.